Georgetown University Press, 9780878408818, 272pp. Charles E. Curran offers the first comprehensive analysis and criticism of the development of modern Catholic social teaching from the perspective of theology, ethics, and church history. Curran studies the methodology and content of the documents of Catholic social teaching, generally understood as comprising twelve papal letters beginning with Leo XIII's 1891 encyclical Rerum novarum, two documents from Vatican II, and two pastoral letters of the U.S. bishops. He contends that the fundamental basis for this body of teaching comes from an anthropological perspective that recognizes both the inherent dignity and the social nature of the human person--thus do the church's teachings on political and economic matters chart a middle course between the two extremes of individualism and collectivism. The documents themselves tend to downplay any discontinuities with previous documents, but Curran's systematic analysis reveals the significant historical developments that have occurred over the course of more than a century. 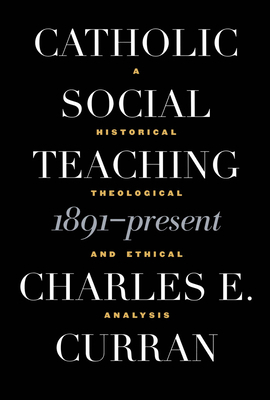 Although greatly appreciative of the many strengths of this teaching, Curran also points out the weaknesses and continuing tensions in Catholic social teaching today. Intended for scholars and students of Catholic social ethics, as well as those involved in Catholic social ministry, this volume will also appeal to non-Catholic readers interested in an understanding and evaluation of Catholic social teaching. Charles E. Curran, a Roman Catholic priest of the Diocese of Rochester, New York, is Elizabeth Scurlock University Professor of Human Values at Southern Methodist University. He was the first recipient of the John Courtney Murray Award for Theology and has served as president of the Catholic Theological Society of America, the Society of Christian Ethics, and the American Theological Society. In 2003, Curran received the Presidential Award of the College Theology Society for a lifetime of scholarly achievements in moral theology, and in 2005, Call to Action presented him with its leadership award. He is the author of Loyal Dissent: Memoir of a Catholic Theologian, The Moral Theology of Pope John Paul II and Catholic Social Teaching, 1891-Present, all published by Georgetown University Press.